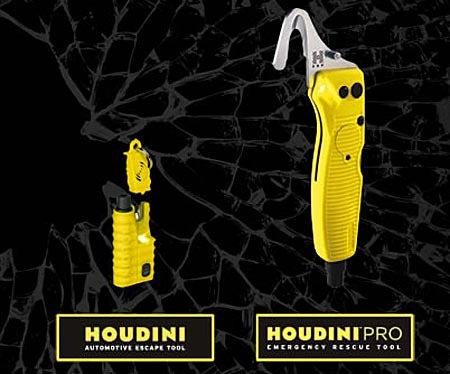 If you’re really big on vehicle safety, you might pick up one of these Houdini Automotive Escape Tools. It would also be great for parents sending their teen drivers off into the world. No, it can’t save them from everything, but at least they’ll be prepared for certain situations. The Houdini tool will help them out when their window needs broken, they need cut out of their seatbelt, need an emergency flashlight or need to call for help. There is also the Pro version of the tool that was created for police officers and firefighters. It’s a bulkier version, and it doesn’t have a whistle to call for help, but it will likely hold up through multiple uses a bit better. The regular version has a small blade for the seatbelt, which also has a cover for when it’s not in use. To break the window, just put the window breaker end of the tool against the window and hold it there till it shatters. Then of course the LED light is pretty self explanatory and the whistle is on the opposite end of the blade and window breaker. You can pick up the pro for $39.95 and the regular Houdini for $24.95.